The guillotine evokes images of horrifying and bloody public executions during the French Revolution in the eighteenth century. Many historians consider this device the first execution method that lessened the victim's pain and the first step in raising public awareness of the morality of the death penalty. It is difficult, however, to think of the guillotine as humane when descriptions of blood flowing in the streets of Paris paint such a gruesome picture. The guillotine was used for a single purpose, decapitation. The device releases a blade that falls about 89 in (226 cm). With the combined weight of the blade and the mouton (a metal weight), the guillotine can cut through the neck in 0.005 seconds. Expert craftsmen, such as carpenters, metal workers, and blacksmiths, made parts of the guillotine separately and then others assembled the parts at the site of the execution. The guillotine was never mass-produced. Although history links the guillotine to the French Revolution, an earlier version of a similar instrument was used as early as 1307 in Ireland. In Italy and Southern France, another guillotine-like device called the mannaia was used in the sixteenth century, but only to execute nobility. Dr. Joseph Ignace Guillotin was a physician and a deputy of the National Assembly of France, an early stage of the Revolutionary government. He recognized and promoted the guillotine's use in 1789. Dr. Guillotin believed this swift method of execution would reform capital punishment in keeping with human rights. Other Assembly members rejected his championing of the guillotine with laughter. In 1792, a public executioner named Charles-Henri Sanson recommended reconsideration of the guillotine and Dr. Antoine Louis (the secretary of the Academy of Surgeons) supported him. In April 1792, Tobias Schmidt (a German piano maker) built the first working model in less than a week. On April 17, 1792, the executioner tested the prototype by decapitating sheep, calves, and corpses from the local poorhouse. On April 25, Nicolas Pelletier (a thief who viciously assaulted his victims) entered the history books as the first criminal beheaded by the guillotine. In its earliest days, the guillotine was called the "louison" or "louisette" after Dr. Louis who had pressed it into service. Later, the name changed to commemorate Dr. Guillotin, who—although he had never constructed a single instrument—came to resent this association. Most commonly, it was simply called "the machine." The most famous victims of the guillotine were King Louis XVI and his queen, Marie-Antoinette. The King was convicted by the Revolutionary government in 1793 for treason. He was decapitated on January 21, 1793. His wife, Marie-Antoinette, was imprisoned for nine months after the King's death until she was also executed by the machine's blade. Charles-Henri Sanson executed the King and his son, Henri, dispatched the Queen. Estimates of the number of lives taken by the guillotine during the French Revolution range from 17,000 to 40,000 citizens. It is thought that three-quarters of the executed were innocent. In its "glory" days, the guillotine took 3,000 lives in one month. Paris was responsible for only 16% of executions; in cities with many counter revolutionaries, like Lyons, many more faced the blade. The locations of public executions were moved frequently. After beheadings, blood continued to pump out of the bodies, overtopping the gutters, and running down the streets. In France, the guillotine remained the official execution device until the last use of the "national razor" in 1977. French President François Mitterand abolished the death penalty in 1981. The platform, posts, déclic for the rope, crossbar, the bascule (bench supporting the body), and the lunette (the device holding the head) were made of hard wood. The mouton was the metal weight to which the blade was attached. The extra weight ensured a swift, clean cut. The blade itself was made of steel, and the heavy-duty rope was cotton. Leather straps restrained the victim's body around the arms and to the bench around the back and legs. A leather bag or basket was also used to catch the falling head. Very few design changes occurred during the history of the guillotine. The primary modification was the adaptation of the size and weight of the machine to a horse-drawn cart when portability was needed to increase the efficiency of the machine. These moveable guillotines were mounted on horse-drawn carts that were also made of wood with wooden wheels strapped with iron. Wood braces were attached to the wheels when the guillotine was used to keep it motionless. 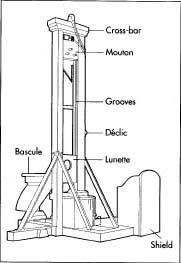 Guillotines were hand crafted locally and were relatively simple to make because they were without ornamentation or refined finishes. The craftsmen were very experienced with wood construction and the honing (shaping and sharpening) of the steel for the blade. 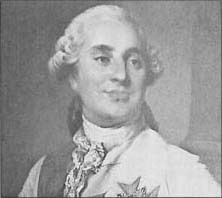 Louis-Auguste (Duke of Berry) was born August 23, 1754. He was the third son of Louis the dauphin, heir to the throne of Louis XV. After the death of his brothers and father, in 1765 Louis became the sole heir. In 1770 he married Marie Antoinette, and in 1774 Louis XVI became king of France. Louis restored the powers of the Parliament, but he was indecisive, easily influenced, and lacked the strength to support reformation against opposition whose positions were threatened by change. By 1788, France was on the verge of bankruptcy. Pressure mounted to invoke the Estates General to handle the fiscal crisis. In May 1789, the Estates General met at Versailles, opening the French Revolution. A Parisian crowd forced the court to move from Versailles to Paris, where it could be controlled more easily. In June 1791, Louis sought to escape from Paris to eastern France. However, at Varennes the royal party was recognized and forced to return to Paris, where Revolutionaries had lost all confidence in the monarchy. In September 1791, the National Assembly adjourned and was succeeded by the Legislative Assembly, On April 20, 1792, France declared war on Austria, which was soon joined by Prussia. France was incensed by the manifesto of the Prussian commander, the Duke of Brunswick, threatening punishment on Paris if the royal family were harmed. On August 10, 1792, the crowd forced the Legislative Assembly to suspend Louis, who—with the royal family—became prisoner of the Commune of Paris. The National Convention, which succeeded the Legislative Assembly, abolished the monarchy and tried "Citizen Capet," as Louis was now called, for treason. He was found guilty, sentenced to death, and on January 21, 1793, guillotined. Construction of the guillotine began with the platform or scaffold. A skilled carpenter cut the lumber for the major pieces including post supports, interconnecting beams, the floorboards, and the steps for the stairway underneath the platform. The stairs bottomed at one open end of the scaffold (on the front side of the guillotine) and opened in an entry or hatch near the other end of the platform at the back of the guillotine. The platform also had an open railing around three sides of the scaffold; the side without the railing was toward the front of the machine and the bottom of the stairs. The supports and beams were all nailed together to form a base. The floor was either built as a separate unit with an underside of wood sheets, much like modern rough-grade plywood, and a top face of long, thin floorboards. The two layers reduced weathering and other damage. The unit could then be lifted in place and nailed to the edges and cross beams of the scaffold. If the guillotine was constructed at the execution site, construction of the platform continued by adding the side rails. The stairway was built while the platform was being constructed by making a four-sided base with interior braces for strength. One side was the front face of the first stair, the back extended from the ground up to form the back of the top stair, and the two identical sides had bottom and back edges forming a 90° angle. Both sides were cut to hold the tops and backs of the set of stairs. While the platform was being constructed, work began on the steel blade and mouton. The width between the posts and the maximum thickness of the blade were provided to the forger or blacksmith. This specialist made a mold for the blade. The cutting edge angled up from one side of the blade (in an oblique angle) to the opposite post. The angle allowed the blade to cut more quickly and cleanly; a blade with an even edge (parallel with the upper cross beam) would have encountered more friction as it tried to cut through the wider back of the neck. Molten steel was poured into the mold. The craftsman sharpened the cutting tip by repeated filing, hammering, and reheating. Worn blades were also resharpened this way. The steel blade generally weighed about 15 lb (7 kg). The mouton was manufactured the same way. The craftsman would melt the metal down and pour it into a mold. After the mold cooled, it would be taken out. The mouton typically weighed 66 lb (30 kg). Workers would then screw the blade to the mouton with three bolts, two in the bottom corners and one in the middle. The bolts would then be welded into place. When the platform was complete or if other carpenters were available, construction of the machine frame began. A small-diameter tree for each post was cut to create a four-sided post, then a groove was cut out on the inside of each post and chiseled so the falling blade would drop smoothly. At the base of the machine, the posts were mounted in a wide crossbar. The blade and mouton were fitted in the post grooves, and a crossbar at the top that was exactly the width between the side posts was fitted in place. The upper crossbar also had a hole in the top for the rope and a groove along the top and side to guide the rope. Metal rings were fixed to the outside of the top crossbar and one or two points down the post to guide the rope. Wood braces were fitted to the outsides of the posts and extended down at angles to the base crossbar for added strength. On the back side, where the victim and the executioner stood, another crossbar was mounted to hold the lunette, which consisted of two separate pieces of relatively thin wood with a hole big enough for the victim's neck. Half of the hole was in the bottom section of the lunette, and the matching half-moon was in the top portion. The upper half was hinged on the post so it could be raised for the prisoner's head. The machine as a separate piece was complete and could be hauled on a cart to the site. The bascule was carved out of wood by a carpenter and transported to the site of the execution. The end of the bascule nearest the blade had leather straps to restrain the victim's arms, and straps crossing the bench kept the back and legs tied down. The déclic was a wooden handle that opened the grooves in the posts. It was attached to the outside of one of the vertical posts so that the executioner could easily release the blade. The rope was is made from natural fibers and twisted into yarn. The yarn is then woven and twisted rope. The rope is tied securely to the top of the mouton, through the hole in the upper crossbar, through the rings, and wrapped around the déclic. In the early days of the guillotine, the executioner cut the rope with a sword to drop the blade, but it became too time-consuming to readjust the rope so they changed the design to incorporate the déclic. The executioner usually owned the guillotine and accessories. Executioners in major cities owned several guillotines and cycled them in and out of use for repair. Quality control of construction and maintenance were entirely the executioner's responsibility. The executioner also maintained a fleet of eight to 10 tumbrels for transporting the victims from the prison to the guillotine. A coach maker constructed and repaired the tumbrels and carts for hauling the guillotine's pieces, but the executioner had to approve the work. With this particular product, quality control was also required for the execution process. Five to eight assistants helped the executioner lead the victim to the machine, remove any clothing around the neck, and cut the victim's hair. They strapped the victim down, placed the victim's head across the lunette, and lowered the top of the lunette around the victim's neck in a series of smooth motions. The executioner released the déclic, the head and body were separated in a split second by the weight of the blade and mouton, and the head fell into a leather bag or lined basket. An assistant raised the head for the crowd's approval, and several other assistants took the head and body back down the stairs where they were thrown into carts for disposal. Heads of well-known victims had the added distinction of being impaled on poles. The guillotine has been relegated to history and lore and is no longer used for executions. In isolated cases, craftsmen make guillotines for entertainment (films and television), but these are built with sophisticated safety systems and often as models. There are books and kits available to make models of the guillotine. The guillotine has since been replaced by other so-called humane ways of executing criminals, such as lethal injection, hanging, gas chambers, a firing squad, and the electric chair. Thirty-eight of the United States apply the death penalty, but Texas leads the number of executed criminals with a total of 253 as of January of 2001. Banfield, Susan. The Rights of Man, The Reign of Terror: The Story of the French Revolution. New York: J. B. Lippincott, 1989. Guillon, Edmund Vincent. Build Your Own Guillotine: Make A Model That Actually Works. New York: Putnam, 1982. Schama, Simon. Citizens: A Chronicle of the French Revolution. New York: Alfred A. Knopf, 1989. Vallois, Thirza. Around and About Paris. Vol. 1. London: Iliad Books, 1999. "Dr. Guillotin's Killing Machine." Maclean's 102, no. 20 (May 1989): 34. Lawday, David. "The Heirs of Madame Guillotine: The Descendants of France's Dynasty of Executioners Today Ponder the Paradoxes of the Revolution." U.S. News & World Report 107, no. 3 (17 July 1989): 46-49. "The Guillotine." Mutimedia World History December 2001. < http://www.historywiz.com >. The declic was only added in 1872, the mouton is made of wood on both models not cast, as described, the rope was never \\\"cut with a sword\\\" to drop the blade, the declic did not \\\"open the grooves\\\" but opened a claw-like mechanism at the top of the chapiteau, the rope always went over pulleys not through a hole, the lunette was never hinged but slid in grooves, the blade was never cast but cut from thin steel plate, the bascule did not have straps. one can see straps, around the upper body, and on the legs. This site is amazing thank you very much for helping me! I think you have overestimated the speed of the device. Even assuming a relatively frictionless fall, which a blade set and falling in tracks with rollers cannot be, and the distance of that fall, applying gravitational forces, a starting speed of zero m/s, the decapitation time is about 1/30th of a second not 1/200th (5/1000-ths).